A considerable number of studies are in agreement that dark chocolate has pronounced health benefits1—provided you eat it in moderation (one to two ounces is recommended by some researchers2). Cacao: Refers to the plant Theobroma cacao, cultivated for its seeds, known as cacao beans or cocoa beans. Knowing the meaning of these terms is important, because if you think you’re improving your health by eating typical milk chocolate candies, you’re fooling yourself. Cocoa and cacao is typically quite bitter, and rarely fancied by self-proclaimed chocolate lovers, who are really craving the sugar added to most chocolate bars and candy. That said, certain types of dark chocolate, as well as raw cocoa powder and cacao, are powerful superfoods, ranking among the most anti-inflammatory and antioxidant-rich foods known to mankind. Interestingly, recent research has shed new light on the mechanism that makes cocoa powder (and dark chocolate) so beneficial for your heart and blood vessels. These benefits, it turns out, are largely dependent on the action of beneficial bacteria in your gut. Research4, 5, 6 presented at the National Meeting & Exposition of the American Chemical Society (ACS) claims to have unraveled the precise reason why dark chocolate is so beneficial. While it’s known that cocoa powder is rich in potent antioxidants called polyphenols, it was thought that these molecules were poorly digested and absorbed due to their large size. Researchers have now discovered that certain bacteria in your gut actually break down and ferment the components in dark chocolate, turning them into absorbable anti-inflammatory compounds that benefit your health. In particular, beneficial microbes including Bifidobacterium and lactic acid bacteria like to “feast” on cocoa, according to the researchers. The microbes also break down the fiber found in cocoa powder, turning it into highly absorbable short fatty acid chains that promote satiety. “[W]e found that the fiber is fermented and the large polyphenolic polymers are metabolized to smaller molecules, which are more easily absorbed. Previous research7 has also shown that eating dark chocolate may help promote gut health by selectively feeding beneficial bacteria, as opposed to harmful ones. It essentially acts as a probiotic, thereby promoting a healthier gut microbiome. One meta-analysis8 published in 2011 found that those who ate the highest amounts of dark chocolate had a 37 percent reduced risk for cardiovascular disease and a 29 percent lower risk for stroke, compared to those who consumed the least. Small amounts of dark chocolate may also reduce your risk of heart attack because, like aspirin, it has a biochemical effect that reduces the clumping of platelets that causes blood to clot. Platelet clumping can be fatal if a clot forms and blocks a blood vessel, causing a heart attack. A stroke is similar to a heart attack, but occurs when the blood supply to your brain becomes blocked or reduced, as opposed to blocking the blood supply to your heart. Another way raw dark chocolate may provide cardiovascular benefit is by assisting with nitric oxide metabolism, as described by Ori Hofmekler.10 Nitric oxide protects your heart by relaxing your blood vessels and thereby lowering your blood pressure. Besides antioxidants, chocolate also contains other potent plant compounds, including anandamide, named after the Sanskrit word for “bliss,” which is a neurotransmitter in the brain that temporarily blocks feelings of pain and anxiety. According to Tod Cooperman,13 president of ConsumerLab.com, which performs independent tests on health products, a recent investigation14 revealed there’s a wide range of quality when it comes to chocolate, and rarely can you tell quality by the label alone. Some brands tested did indeed have high levels of antioxidants, but others did not. Some brands had three times the concentration of flavanols compared to others, and one chocolate bar marked 85 percent flavanols actually contained less of the antioxidant than a bar labeled 72 percent. As reported by Times,15 this kind of discrepancy is due to the fact that “the percentage is a sum of cocoa liquor, cocoa powder and cocoa butter—and cocoa butter does not contain flavanols.” The labels of some brands, however, were very accurate, including Ghirardelli and Endangered Species. Interestingly, Consumer Labs also found that dark chocolate bars may be a safer choice over raw cacao powder, as many of the latter were found to be contaminated with heavy metals. That said, the closer your cocoa is to its natural raw state, the higher its nutritional value. To avoid contamination issues, I recommend looking for fair traded organic varieties. Ideally, your chocolate or cocoa should also be consumed raw (cacao). When selecting a chocolate bar, you can optimize its nutritional value by looking for higher cacao and lower sugar content. Type of sweetener: Not only should you choose chocolate with low sugar content, but you should also look at what form of sugar it contains. 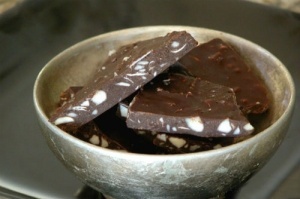 Honey is sometimes used to sweeten raw chocolate products, which is a good choice (in moderation). If you can find chocolate sweetened with Stevia or Luo Han, that would be preferable to cane sugar, fructose , or high fructose corn syrup. Strictly avoid any product containing artificial sweeteners . Fructose will reverse some of the positive benefits of chocolate, as it breaks down into a variety of harmful waste products, one of which is uric acid. Uric acid drives up your blood pressure by inhibiting the production of nitric oxide in your blood vessels, which helps your vessels maintain their elasticity. So, excess fructose can lead to elevated blood pressure, as a result of nitric oxide suppression. It also promotes insulin resistance, which is at the heart of virtually all chronic disease. Type of fat: Fat in chocolate, as long as it’s the right kind, is a good thing. It slows down the absorption of sugar, lessening the insulin spike. Ideally, the type of fat in your chocolate bar should be what is contained in the natural plant—cocoa butter. The primary fatty acid in cocoa butter is stearic acid, which is the only saturated fat that favorably affects HDL, without adversely affecting LDL. Coconut oil  would be the next best fat in chocolate. Make sure you avoid soybean oil (and any other form of soy), and other vegetable oils and trans fats. To learn more about the health benefits of high quality chocolate, please listen to the following interview with Dr. Beatrice Golomb, in which she also discusses how to determine your ideal therapeutic dose. In general, it seems preferable to consume smaller amounts of chocolate at more frequent intervals, much like the principle of split dosing for supplements, in order to ensure a steadier stream of nutrients in your bloodstream. According to Dr. Golomb, studies show daily chocolate consumption in divided doses (two to three times per day) is probably beneficial, as long as you aren’t going overboard in quantity, and as long as you’re eating high-quality chocolate.